This puzzle table recap is only half the size of my previous recap post in mid-November. This is the result of having an entire week off before Thanksgiving and a two day week before Christmas that was taken up by boring semester tests. I could save these three puzzles for a few weeks to make for a longer post, but I like the idea of having them separated by semesters. Since I didn't start my puzzle table at the very beginning of the school year, we only made it through nine puzzles during the first semester. Not sure what I mean by a puzzle table? Inspired by Sara VanDerWerf's idea of a play table, I put out a new puzzle for my students to play with during spare class time each Monday. The puzzle stays out for the entire week to spark student interest and curiosity. Some of the puzzles I use have been purchased. Others are puzzles I downloaded and laminated for durability. 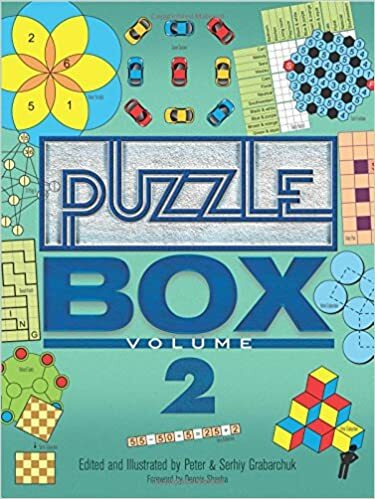 Most recently, I have been finding puzzle inspiration from the Puzzle Box books (Volumes 1-3) which are published by Dover Publications (affiliate link). Two of the puzzles in this recap come from this series of books. 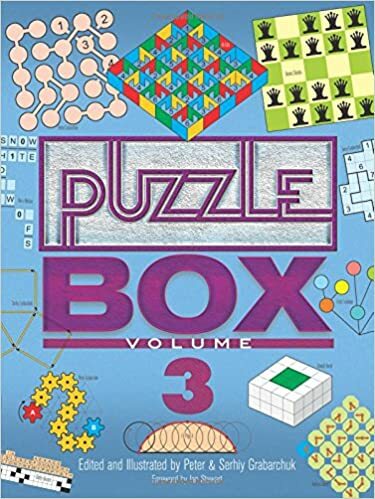 Each volume has 300 puzzles. What I love most about this series of books is that there is such a great variety in puzzle types. You aren't stuck with just sudoku puzzles, kenken puzzles, or traditional logic puzzles where you have to figure out which person matches with which food and drives which car which is which color. 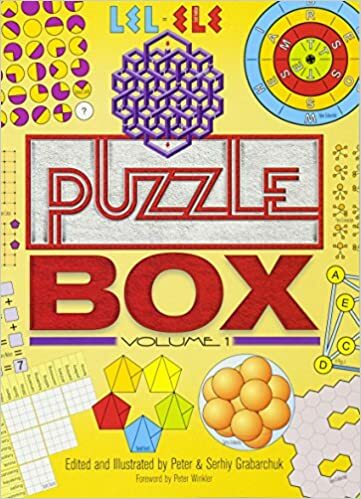 Sure, you will find some Japanese style logic puzzles and traditional logic puzzles inside, but the books are chock full of interesting puzzles of all different types. I highly recommend using the "Look Inside" feature on Amazon to get an idea of the awesome variety of puzzles. So many of these logic puzzles can be adapted for classroom use, so these books are perfect for math teachers. 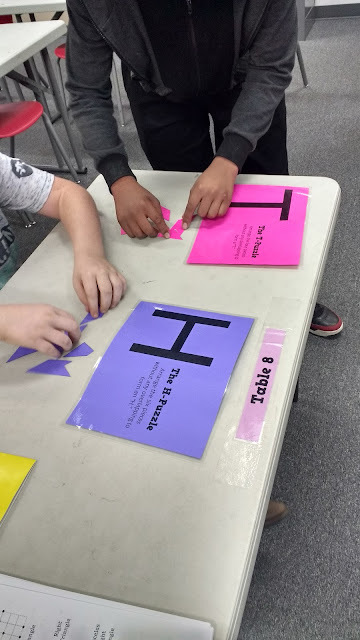 Recently, I've been asked where my puzzle table is in relation to the rest of my classroom. See that small table right in front of the SMARTboard? This is where my puzzle table currently lives. I chose this table because it is rarely used by my students. Mainly it is there to serve as a demonstration table for my chemistry class. I do have one student who sits there because of eye sight issues. And, I have eight students in my math concepts class and eight tables, so you can do the math there. I'm not sure if this is the best placement, but it works for me for now. 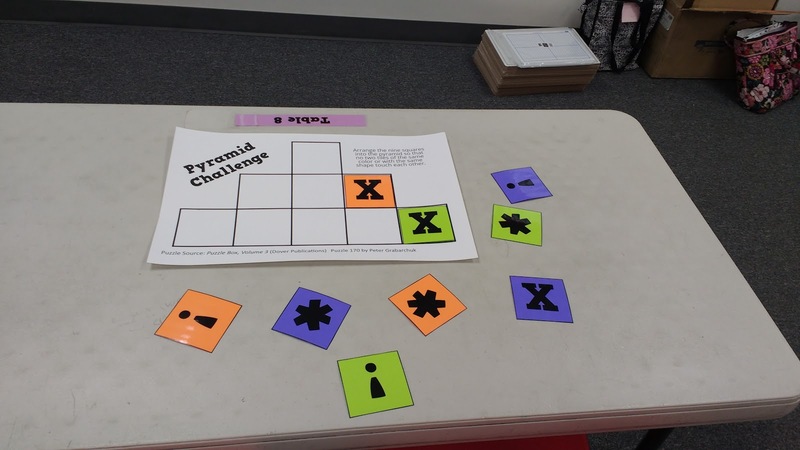 When I start a puzzle table from the beginning of the year in the future, I will probably plan it into my classroom design a little more thoughtfully. This puzzle represents my new puzzle table obsession: shape fitting puzzles. When I flip through the Puzzle Box books, these are the puzzles my eyes are drawn to. These are the puzzles that I know my students will be sucked in by. Need proof that I'm obsessed by this type of puzzle? I recently created my own Christmas-themed shape fitting puzzle. I sadly didn't get to use it with my students because I made it during Christmas Break. 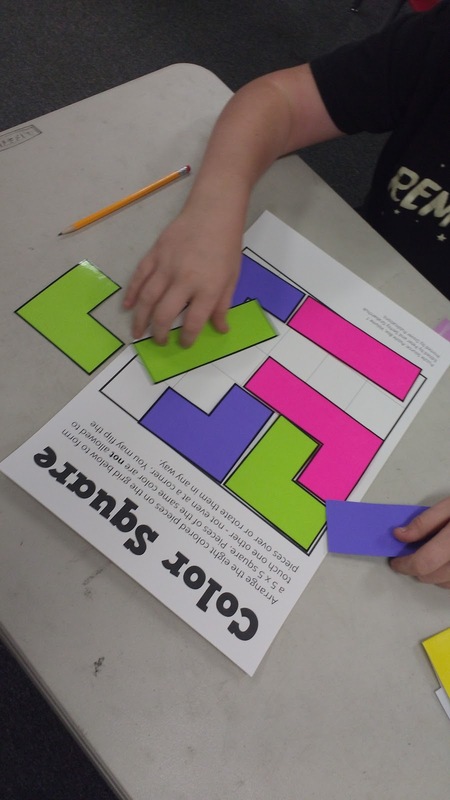 The goal of this puzzle was to take eight pieces in three different colors and arrange them (without overlapping) so that the square on the puzzleboard was formed. Each piece could only touch pieces of different colors. Pieces of the same color weren't even allowed to touch at a corner! You can learn more about this puzzle and download the files I created to use this puzzle with your own students here. This puzzle wasn't so much a test of trying to get puzzle pieces to fit a shape but to try and get students to lay their puzzle pieces in such a way as to follow the prescribed logic. No two puzzle pieces of the same color could touch at an edge (touching at corners is okay). Also, no two puzzle pieces with the same picture are allowed to touch along an edge (again, touching at corners is fine). This puzzle really tested my students' instruction reading ability. Check out this student's attempt at a solution. He has two exclamation points touch one another. This student had read the part of the instructions about colors not touching but had stopped short of the part about pieces with the same shape touching. 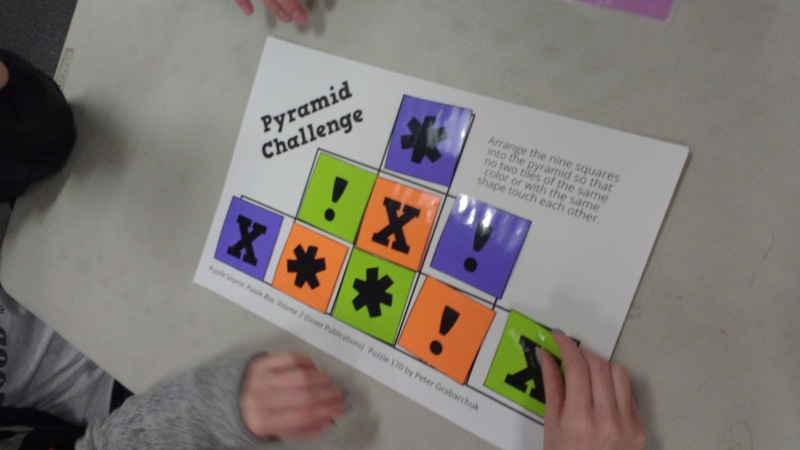 I wrote a blog post sharing more about this puzzle and the files to download a copy for your own classroom here. This was my first attempt at placing two different puzzles on the puzzle table. Sadly, these puzzles didn't end up getting much play because I decided to fit way more into the last full week of the semester than was probably wise. But, there was no way that we weren't going to finish our current chapters before our semester test and Christmas Break! The T Puzzle got quite a bit more play than the H Puzzle. I'm curious if this had to do with the differences in numbers of pieces. Nobody ended up solving the T puzzle, however. Each student who tried commented that it was just impossible. My husband even gave it a shot one evening while waiting for me to pack up my stuff and declared it to be impossible. I'm looking forward to trying out even more different types of puzzles with my students during the upcoming semester! I'll be sure to keep you all updated with how it goes. Now, I'm off to plan my first six weeks of puzzles for the new semester. Isn't that how everyone spends New Years Eve?!? Yes, it's Tuesday. 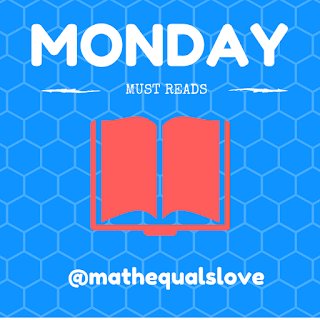 Yes, I am posting my weekly Monday Must Reads post a day late. Yesterday was Christmas, so it's totally okay. I hope everyone had a lovely Christmas time with their family. My husband and I enjoyed spending the day with my parents and sister. Our day was full of yummy food, catching up, and playing some of our new board games we received as gifts. I'm especially proud of myself for still making time to exercise after we got home. I got an exercise bike for Christmas LAST YEAR, and I still haven't made a habit of using it regularly. I've been taking advantage of having a pretty lax schedule while on break to try and create an exercise habit. Okay, enough about me. 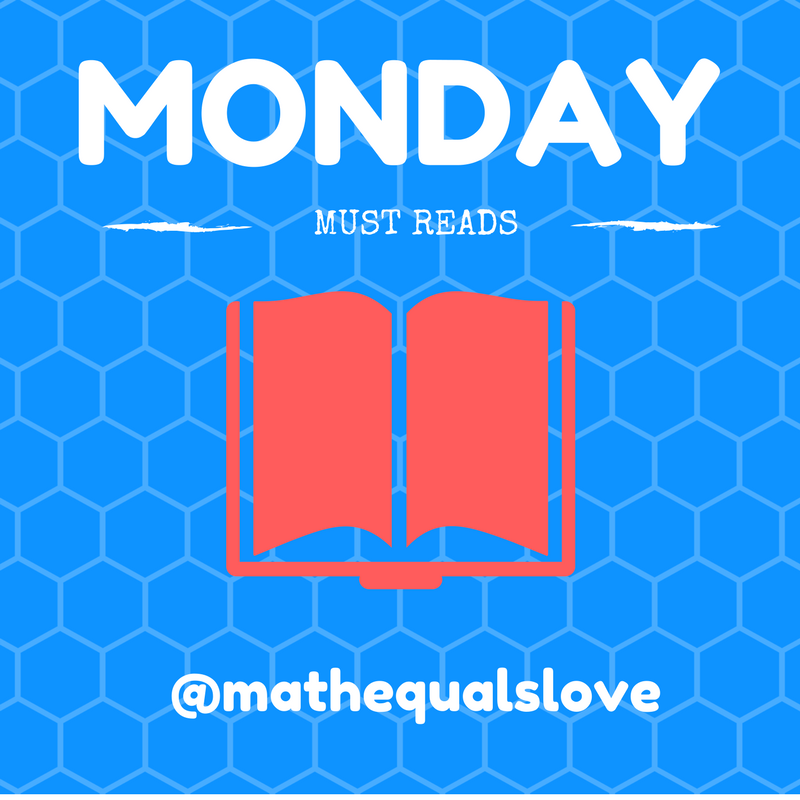 Let's get on to this week's "Must Reads!" This week is very Christmas-focused. I'm sure everything will start to return to normal next week. Want more statistical awesomeness from Anna Fergusson? Check out her Teaching Statistics is Awesome blog! I especially like this task from Anna's twitter account. What story would your students come up with? Check out one person's Christmas-y story for this graph. Charice Nusse offers another statistical question to pose to your students. I imagine this would be a great conversation starter! Vanessa Medina shares a fun system to solve. I love that this uses greek letters as variables. I think we need to expose students to greek letters sooner in math than we currently do. If you are not following Jae Ess on Twitter, you need to fix that NOW. You are missing awesome ideas and activities like this Buddy the Elf project that can be used for practicing either slope or the pythagorean theorem. This is teacher creativity at its best. Be sure to check out Jae's blog here. Here's another great idea from Jae that shows her innovative spirit. Bobson Wong shares some great graphs and suggests a very creative way to use them in your classroom. You can view the graphs here. Looking on hands-on math-y goodness? Becky Warren has compiled an awesome list of ideas that only require paper and scissors. Check out Becky's beautiful blog here. If the above awesomeness wasn't enough, Becky has also compiled a list of math-y printables for you to use with your students! They can also be found on her blog! dailySTEM shares a fun Christmas puzzler to tuck away for use next year! Emma Bell has created a bunch of image based Christmas challenges for you to use with your students next year. Check them all out here on her blog. Tina Palmer's students created a beautiful fractal tree while working on similar figures. How inspiring! Looking ahead to Easter, here's an interesting task from Debbie Barker. Mathematically, what makes for a good egg? MathsWhizzKid shares a great first blog post about creating a stimulating learning environment. I especially love this perpendicular bisector bulletin board! 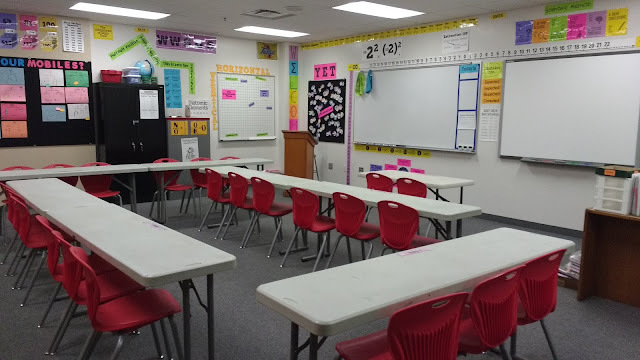 JustMaths shares the intriguing idea of posting commonly used formulas on the backs of chairs in your classroom in a recent blog post. Check out the post to find free downloadable formulas to help you do the same! Sue de Pomerai offers up an interesting Fermi estimation problem with a Christmas twist. Tina McNally makes me wish I was still teaching physical science with this fun inertia exploration activity. Ed Southall shares a winter themed geometric puzzle. This one isn't too Christmas-y, so you can still use it after you get back from Christmas break! Need something to keep your brain sharp over Christmas Break? Check out this lovely crossnumber puzzle from the UK Mathematics Trust. Regolo Bizzi shares a gorgeous Christmas tree tesselation. A great Christmas challenge for next year would be to have your students create their own holiday-themed tesselations! Check out the 10% body models that Colleen's students created as a math/art project. I also am inspired by this likelihood line that Colleen's students created. Each student wrote a scenario on a post-it note. The rest of the class had to decide where to place the statement on the likelihood line. Lam Nguyen shares several interesting Smudged Math activities. First up: Cookie Recipes! How about some log laws? I am also really taken by this area vs. circumference task from Lam Nguyen. David Coffey shares a message ALL math students need to hear. Christine Redemske combines centroids for balancing triangles with the Christmas season to produce some beautiful results. Natalia Serwylo demonstrates how to combine a number line with the pythagorean theorem to help students visualize plotting square roots on a number line. Tina Cardone shares an idea for combining vocabulary practice with snowflakes for some festive fun in math class. Looking for a science-y way to celebrate the Christmas season? Shelby Roth uses Christmas slime to teach about conservation of mass. Maths Ed shares a fun puzzler involving syllables and letters. Also from Maths Ed: a brilliant description of why correlation does not necessarily mean causation. Simon Quinn offers up yet another Christmas puzzler. Can you figure out how many presents Father Christmas has in his bag? Ashley Tewes shares a fun and engaging project involving 3D Printing. Seta Moore-Bridge shares a fun guess my number game that would be great for using those odd few minutes that are occasionally left at the end of class. I love this poster shared by Randy L Revels, Jr.
Ms Tang inspires with her science-themed Christmas tree. I MUST put up a tree in my classroom next year. Cynthia Platou shares an engaging idea that could be adapted for any subject: turn your classroom into a court of law! Kim Spek combines the art of printing with the art of mathematics to produce something beautiful! If I was the judge, Allison Kipping's door would definitely win the door decorating contest! Luke Walsh recognizes that a holiday gift bag is actually a brilliant Which One Doesn't Belong (WODB) problem. Iva Sallay shares instructions for making adorable origami Santa stars on her blog. Amanda Atkinson shares a photo of a thoughtful gift she received. I want to have my students make these next year for all of the teachers in the building. Elyssa Stoddard's students produced some beautiful projects using their compasses! It's never too early to start planning for Pi Day. Wendy Sargent shares some ideas for celebrating. Until next week, keep up the awesome sharing of ideas!